Welcome to Air Force Reserve Officer Training Corps (AFROTC) Detachment 430! We are proud to offer you an exceptional opportunity to embark on a positive and life-changing journey in the United States Air Force. Our multifaceted training program produces disciplined and professional Air Force officers who understand the historical legacy, leadership principles, and future challenges of the world’s strongest and most technologically-advanced Air Force. 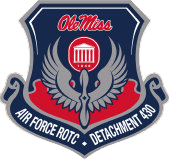 If you have a drive to serve your country and are looking for excellence, Detachment 430 is the right fit for you!